The U.S. Constitution is a blueprint for a free society as well as a source of enduring conflict over how that society must be governed. The competing ways of reading our founding document shape the decisions of the Supreme Court, which acts as the final voice on constitutional questions. 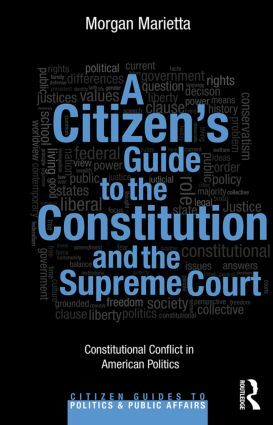 This breezy, concise guide explains the central conflicts that frame our constitutional controversies, written in clear non-academic language to serve as a resource for engaged citizens, both inside and outside of an academic setting. After covering the main points of conflict in constitutional law, Marietta gives readers an overview of the perspectives from the leading schools of constititional interpretation--textualism, common law constitutionalism, originalism, and living constitutionalism. He then walks through the points of conflict and competing schools of thought in the context of several landmark cases and ends with advice to readers on how to interpret constitutional issues ourselves. The Core Disagreement: How Should We Read the Constitution? Judicial Review: Is It Legitimate and Expansive, or Questionable and Limited? Rights: Are ey Individual or Collective? Federalism: Must We Have One National Standard? Liberty: Does the Constitution Invoke Ordered Liberty or Pure Liberty? Religion: Is the Constitution a Religious or Secular Document? Transcendence: Do Transcendent Rights Exist in the Constitution? Social Facts: Should the Supreme Court Move Ahead of Society or Wait for Social Change? Precedent: When Should We Follow or Break from the History of the Court? Completeness: What Else Do We Need to Read?